Just over a year ago I was frustrated. We had just moved back to Kenya and I was trying to outfit our house with a few necessities. Just finding sellers of the items we were looking for was a pain, as there were no options for classifieds services online that had much to offer. Being a builder and a problem solver I wanted to better understand what was going on here. Why, in 2010 did I have to go to one of 7 large shopping centers across town, in Nairobi’s terrible traffic, in order to look at a notice board to find products? With this in mind, I sat down and penned a strategy paper that I thought could address the problem. No organization or entity in Kenya has come up with a good classifieds network. There is little, to no, traction in the online space and the offline arena is a fractured market where each group protects their fiefdom and doesnâ€™t share their ad content. This is seen in the popularity and reach of the classifieds at major shopping centers like Sarit Centre, Yaya and Village Market, but also in the newspapers and mailing lists. There is also no good option for digital classifieds, even though there have been multiple attempts, including Nation Media Groupâ€™s N-Soko, Craigslist Kenya and eBayâ€™s Kijiji as well as many small operations by Kenyan developers. This fractured landscape, as well as a missing digital nexus point for classifieds in Kenya, creates a large and open opportunity. Real money is ready to be made, as there are many frustrated buyers and sellers who need an outlet. In order to succeed at making real money with classifieds listings in Kenya, one needs to have a strategy for both the analog and the digital sides. 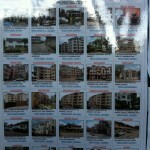 Itâ€™s not enough to make a great classifieds website – as N-Soko and Craigslist are showing us. Neither is it good enough to have just offline newspaper ads or shopping center message boards. The document went on for another 5 pages outlining a solution that I thought married up what was needed: a way to mix Kenya’s analog community habits and the efficiencies of a digital solution. A couple months later I was discussing this with David Kobia, my colleague at Ushahidi, talking about how there are wide open opportunities like this in Kenya where there is a clear void that no one is filling. It’s not hard, it just takes focus on a simple platform that’s both web and mobile enabled, along with a way to bring in the analog side. Fast forward a couple of weeks and David built a little site for this purpose over the weekend, called Pigia.me. A place for us to experiment with, and we did. We spent some time gathering classifieds from the shopping centers and the newspaper. We did some Facebook ads. 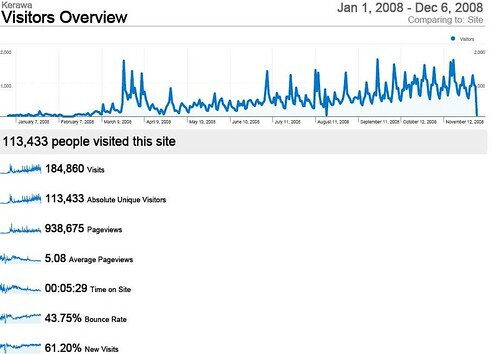 It worked, we quickly got up to over 3,500 listings and traffic was increasing. Total investment 3 days coding and $300 in ads. But we didn’t have the time. Ushahidi keeps us way to busy, as does the iHub. 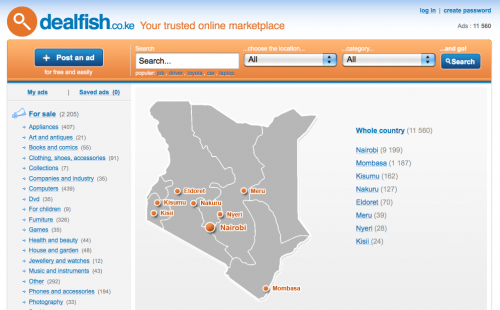 About 3 months ago Dealfish, the big classifieds site owned by MIH in South Africa, launched in Kenya. Simultaneously it launched in Nigeria, Tanzania, Uganda and Ghana (English). And in Francophone Cameroon, Ivory Coast, Senegal, and the DRC. They scooped up well-known tech entrepreneur and blogger Moses Kemibaro from Dotsavvy to run East Africa’s operations, while Neil Schwartzman overseas all Sub-Saharan Africa for Dealfish and Stefan Magdalinski presides over Dealfish as well as Mocality and Kalahari for all but South Africa. They’re now at approximately 12,000 listings (in Kenya), serving the major urban areas and have about 6000 “answers” per month (which is what they call it when a buyer tries to contact a seller). The top areas are auto, home and jobs – like most classified sites. Until critical mass is reached, classifieds are something that you have to put a lot of energy towards on a constant and consistent basis. Thus Dealfish has chosen Kenya and Nigeria as their first focus-countries, where they have dedicated personnel. MIH has deep pockets, and they’ve decided that there is a future in investing in digital arena in the Africa outside of South Africa. They came on strong with online ads by Google, Facebook, Inmobi, Admob and Buzzcity. Inmobi has given them the best return, with Google ads in second place. However, it’s the Dealfish team notes that the Inmobi traffic doesn’t have nearly the same intent to buy or sell as the Google traffic – it’s blind coming in. Offline Dealfish used radio, in-store advertising, posters in malls and in club bathroom stalls. The form of advertising dictates the type of user, whether they use mobile phones or PC web. In the beginning mobile users were their predominant type, but now it’s split 50/50 between mobile and PC web users. Dealfish is doing well, and will continue to do so, especially as they have enough financial backing to continue seeding the market. Their competition comes in the form of verticals that are specifically created for a niche market. 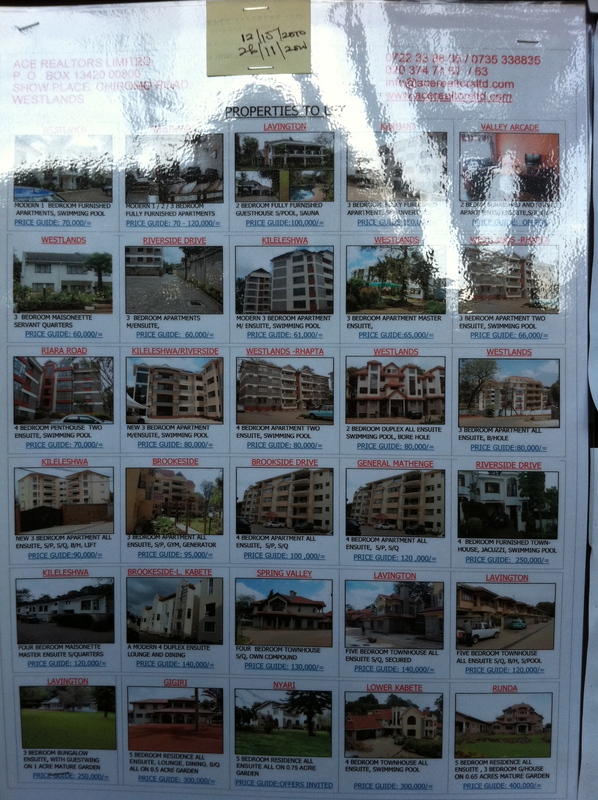 In this case, autos with Cheki, jobs with Brighter Monday and homes with Property Kenya. And that’s just in Kenya, they’ll fight that same battle in the other markets as well. The only other classifieds system that has made a dent in Africa is Kerawa, operated out of Cameroon. They have thousands of listings in quite a few countries. They’ve done this over the last 3 years, bootstrapped and growing organically. However, there’s a danger in trying to go after everyone and everything. In the broad classified space there is only a single winner, no prizes for second place, except in niche areas. Whoever reaches critical mass first wins, and the rest can go home. It’s better to win in a couple countries than to lose in all. 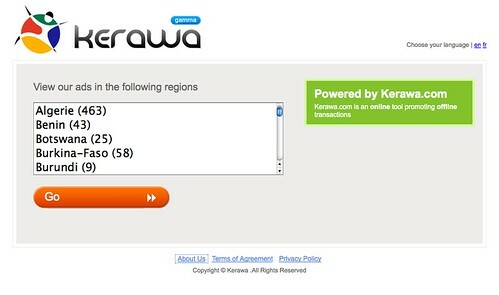 Both Dealfish and Kerawa have to fight the very real issue of spam listings. Just letting anything to so as to get bigger numbers only decreases the value to the user. How customer service and clarity of use and value play out to the listing companies and people is where a lot of time and resources can be spent. Finally, you have to start in the urban areas due to users, devices and general “mass”. However, if you think that’s enough, then you haven’t learned the lessons taught by the mobile operators. That is, urban is your anchor, but rural is your long tail, your reach. Any attempt to get enough critical mass to make serious money off of traffic or transactions has to reach beyond the cities. The towns and rural areas are untapped and ripe for the approach. Phase 2 of this approach should look a lot like what I wrote about back in 2009, on how village billboards should be leveraged alongside the mobile phone shops in smaller communities. There have been a number of plays on the free classifieds space in Africa over the years. Most seem to fizzle out, either due to not having enough revenue to continue, or their owners losing interest before the site grows. It seems like a play in the same space as Craigslist and Kijiji (Gumtree in SA) should work well. After all, you don’t need to digitally handle the transaction, that takes place offline. Kerawa started just this year, from a small team of guys in Cameroun. They report having listings in 42 countries, but some are limited to just a couple. What’s more impressive is seeing how lively it is in Cameroun, Morocco, Ghana and South Africa, their top 4 countries. What a spread! That means they’re doing decently well in all but East Africa. I remain convinced that services like Kerawa will not become mainstream in Africa until they build the application in such a way as to allow mobile users to really take part. This seems obvious to me, so I’m not sure why they haven’t created a downloadable J2ME application for this at the least. Maybe they could create a way for people to access it via SMS, or at least pay for alerts on certain items (like jobs). Kerawa posted their analytics for the year thus far. It is trending up, which is a good sign. What’s more important is numbers on classified listings, as once you get a decent amount of both buyers and sellers, then you’ve achieved critical mass and become “the” place to go. No one wants to go to the 2nd best market in town (just ask eBay’s and Craigslist’s competitors).